IAMBRIGITTE : they are here! my 16-samples of BB cream are here! I honestly got confused as to what brand to sample first. I checked some reviews so I'll have an idea what to get. I have samples from Skinfood, Tony Moly, Baviphat, Missha, Hanskin to name a few. I've been sampling these past few days and I have one that I am getting in full size. Yey! 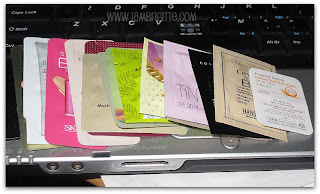 but yes, i'll still (try) to sample all of them and post a bit of review here..and probably an FOTD? let's see..
the seller gave me some freebies too! 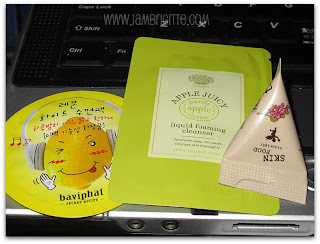 I can't wait to try everything...I'm again a willing guinea pig, LOL! What a nice haul! I look forward to your reviews! Where'd you get that?!?! I WANT! same here...where did you get that>>>? ?